Michael Keohi was hired in June of 2018 as Fire Chief. He has over 40 years of firefighting and leadership experience with The Lakewood Fire Department and more recently, West Pierce Fire and Rescue. He started as a volunteer/resident firefighter in Parkland WA before starting his professional career in 1975. Chief Keohi has extensive experience as a firefighter, company officer, battalion chief/shift commander, training chief, assistant chief and fire academy chief. The Chief is responsible for the current mission of the Department and identifying a strategic plan for the future. 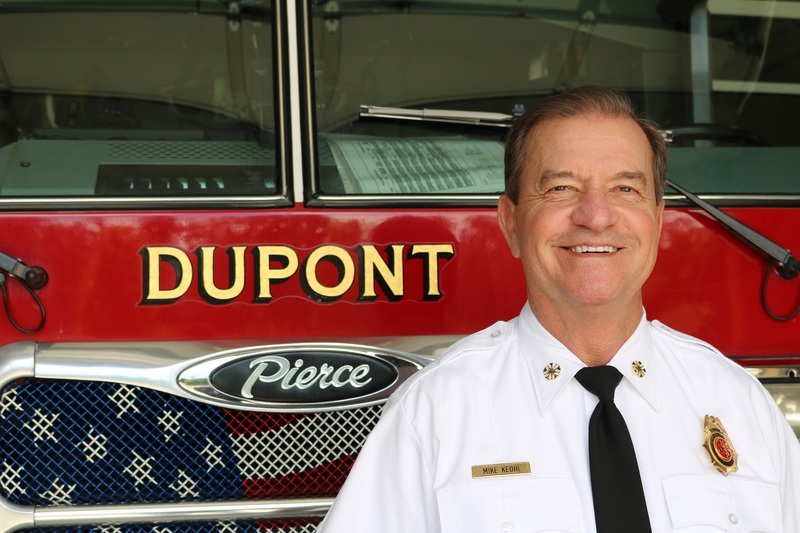 DuPont is a growing city and emergency service demands are increasing. Building a competent, well-equipped and staffed Fire Department is a basic requirement for maintaining quality of life, security and safety for all of our citizens.